Emailchemy is a friendly piece of software that allows you to convert your email messages from less common proprietary formats to common and poplar ones. With this tool you can easily archive, import, export or create databases containing your email addresses. For those using the app for the first time, it’s recommended to give the user manual available on the official website a quick read. The program also allows you to import your emails to third-party email software and also includes an IMAP mail server. Emailchemy bundles an Advanced Conversion function which lets you control a wealth of email conversion parameters, as well as a Conversion Wizard to help you go through the complete process with ease. 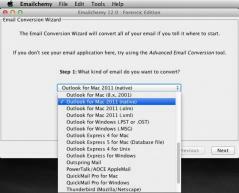 Regarding supported email formats, Emailchemy lets you read emails from popular mail clients like Outlook, Yahoo! Mail, Netscape, Thunderbird and others. It is also possible to export your email messages to formats like CSV, RGE, MBOX, RFC, IMAPdir and EML. A website crawler tool, that visualizes site structure and shows a website as a set of pages and their outbound and inbound links.